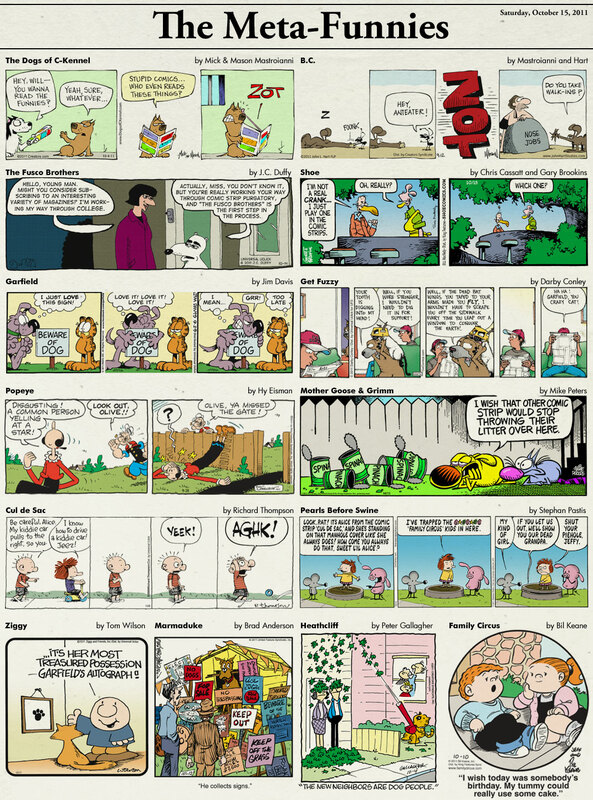 Now, some of these strips are extra-referential per se, but they still seem to work well in conjunction with the others. Popeye, for example, is called out in Mother Goose & Grimm and I managed to find a recent Popeye strip in which the fence background can carry through into Grimm. Similarly, the sidewalk Alice races down continues into Pearls which is sitting atop Circus. Marmaduke makes a sign reference, borrowing the theme from Garfield, while Heathcliff's caption is now both inter- and intra-textual. Admittedly, the B.C. and Dogs of C-Kennel bit is a tad forced, since the same guys work on both strips. I tried setting up some strips around Shoe to make it look like that strip was happening at the top of the tree, the strip below it would be a little lower on the tree, and the one below that would be at the base of the tree. 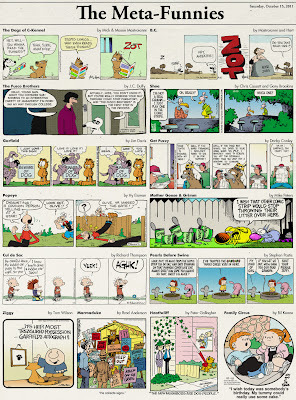 But that set-up caused some broader layout problems, and I couldn't find a dog-related single panel strip to drop in next to Heathcliff that even had a tenuous connection to anything. One interesting thing I noticed was that Garfield was, by far, the most referenced comic while Davis' strip itself didn't directly reference anything else. I suspect that it has a lot to do with Garfield's broad syndication, making it an easy go-to strip that the vast majority of newspapers carry. The closest thing to a sure-bet that another comic strip writer could guess was running in most, if not all, of the same papers s/he was in. Further, the character is popular enough that, even if a paper didn't carry it, readers would still likely recognize the name. As I said, though, I only went back a month or so for these and only worked on it for a day. (Quite a bit less than a day, actually!) I think it'd be fun to do a whole series of these over multiple days, if you expanded your range to the full runs of series, and could almost make each page about a broader story unto itself.